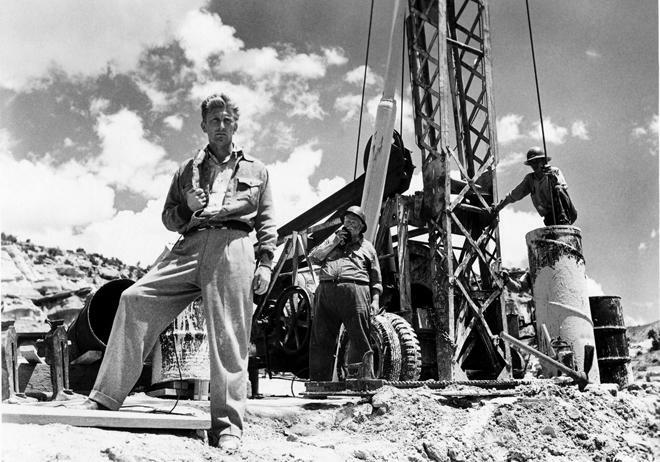 Billy Wilder's 'Ace in the Hole' is one of the most scathing indictments of American culture ever produced by a Hollywood filmmaker. Kirk Douglas gives the fiercest performance of his career as Chuck Tatum, an amoral newspaper reporter who washes up in dead-end Albuquerque, happens upon the scoop of a lifetime, and will do anything to keep getting the lurid headlines. Wilder's follow-up to 'Sunset Boulevard' is an even darker vision, a no-holds-barred exposé of the American media's appetite for sensation that has gotten only more relevant with time. "Bad news sells best. Cause good news is no news." Fueled by sensationalism, questionable ethics, a desire for personal gain, and a rabid thirst for ratings, the shadowy corners of journalism often sacrifice truth and integrity for a more marketable version of reality. A reality easily summed up in attention grabbing headlines and carefully constructed narratives, all perfectly designed to be easily consumed and then tossed away by the masses. But what happens when the reporters themselves become active participants in the story? What happens when they purposefully manipulate events in order to suit their own agendas? 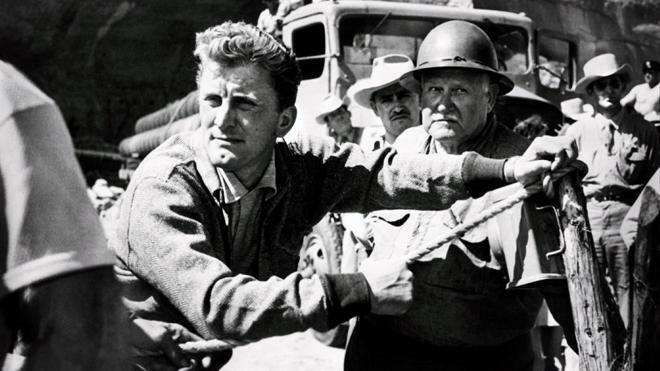 A dark and biting satire on the American media machine, Billy Wilder's 'Ace in the Hole' proves to be eerily prophetic in its social commentary and remains just as relevant today as it was over sixty years ago. In fact, it's probably even more relevant now, weaving a caustic and thought provoking condemnation of exploitation and mindless consumption -- all filtered through the legendary director's trademark cynicism and noir sensibilities. Loosely inspired by real events, the story focuses on a down-on-his-luck but ambitious reporter, Chuck Tatum (Kirk Douglas), who is looking for a way to catapult his career. When a man, Leo (Richard Benedict), gets trapped in a cave, Tatum seizes the opportunity to cover the story, hoping to use its human interest angle to captivate readers. Blinded by his own self-serving goals, the journalist creates a news frenzy and soon hurtles toward stardom. But as his report grows in popularity, Tatum begins to manipulate the situation, deliberately putting Leo's life in danger in order to keep selling papers -- a tactic that could prove deadly. The term "media circus" gets thrown around a lot in our society, but under Billy Wilder's direction, that idiom takes on a very literal form. As Tatum selfishly prolongs Leo's dire situation, the cave site becomes a veritable tourist attraction with curious spectators that begin to crowd around and camp out, hoping to bear witness to the trapped man's rescue… or demise. This community of "well-wishers" gradually grows in volume until a genuine carnival of citizens and reporters forms -– complete with a Ferris wheel and a band playing a specially written (and irritatingly catchy) song performed in Leo's honor. Though slightly exaggerated through Wilder's scathing satire, this literal media circus becomes a disturbingly accurate representation of how journalists and the American people choose to portray and consume sensationalized news, turning potential tragedies into frivolous spectacles. And at the heart of this increasingly chaotic storm of dramatized truth, is Chuck Tatum. Actor Kirk Douglas turns in an exceptional performance as the cocky and opportunistic reporter. Tatum is confidant and hungry, yearning to make it big, and Douglas portrays this cut-throat desire for success with palpable passion and egotism. Though he starts out as a seemingly friendly manipulator, his increasing disregard for Leo's wellbeing eventually grows out of hand. To this end, the character is exceedingly unlikeable throughout the runtime, clearly putting an innocent man's life at risk just to further his own success. Add in some unsavory misogyny, and Tatum easily becomes one of the director's most unsympathetic protagonists -- and yet, even he must have his limits, right? After all, the story won't work if Leo dies, will it? These questions become central to the film's climax, and Wilder uses these sardonic themes to create a powerful critique on all aspects of the media. Likewise, the director weaves in his trademark penchant for wit and noir visuals throughout all of the drama, backing up the scathing social commentary with cynical humor and potent cinematic style. Witty dialogue helps to lighten the mood here and there without deflating the movie's serious observations. And though the director deliberately refrains from drawing too much attention to the camera, the film's aesthetic is still quite striking. Wilder relies on many long takes with wide masters and key cuts, letting the acting speak for itself. The movie also uses shadows to mask characters' faces to imply deeper meaning and emphasize mood. Background details and layers within the frame are important as well. One scene, for instance, features Tatum discussing the rescue plans for Leo while Leo's wife, Lorraine (Jan Sterling), is visible in the background of the shot. Though the emphasis is still on Tatum and his collaborators, Wilder's framing manages to economically and subtly reveal that Lorraine is listening in on the conversation, and her physical placement, just slightly out of focus, speaks volumes about her character's bearing on the story. Little touches like this litter the film, delicately using composition, movement, and editing to bolster the tone and deeper textures of the story. Traditionally, a reporter is merely supposed to report the news, but in Billy Wilder's 'Ace in the Hole,' a reporter takes it upon himself to make the news -- creating an absolutely scornful and thought provoking treatise on the ethics of journalism and the pitfalls of our obsession with sensationalism. Though the film was unjustly ignored and misunderstood upon its initial release in 1951, the movie is somehow even more relevant now and serves as a disturbingly accurate portrayal of what is becoming the norm for 21st century news culture. Truly ahead of its time, the film rightfully earns a spot in the director's celebrated filmography of masterpieces, sitting proudly alongside such classics as 'Sunset Boulevard,' 'The Apartment,' 'Some Like it Hot' and 'Double Indemnity.' And that's not just exaggerated journalism at work -- that's the truth. I swear. 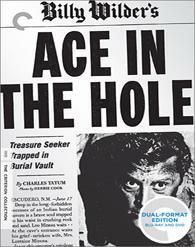 Criterion brings 'Ace in the Hole' to Blu-ray in a dual format release that includes a BD-50 disc and two DVDs (which contain all of the same content as the Blu-ray). The discs come housed in a foldout case packaged inside a cardboard slipcase with spine number 396. A booklet with essays by critic Molly Haskell and filmmaker Guy Maddin is also included. The movie is provided with a black and white 1080p/AVC MPEG-4 transfer in the 1.37:1 aspect ratio. Authentic and richly textured, this is a strong video presentation. The majority of the source print is in very good shape, with a natural layer of light to moderate grain, but there are some minor specks and faint lines visible from time to time. Likewise, there are a few comparatively rough and soft shots here and there with very minor stabilization issues and signs of pulsing. Thankfully, however, most of the image features a clean picture with impressive clarity, offering a pleasing sense of fine texture. Suit patterns and little details on the characters' sweaty, dirty faces are especially striking. Contrast is good with a well-balanced grayscale marked by bright whites and solid black levels. Despite a few negligible age-related inconsistencies, 'Ace in the Hole' comes to Blu-ray with a beautifully filmic transfer free from any troublesome artifacts or processing. The film is presented with an English LPCM mono mix. Basic but certainly suitable, this is a good track with only minor issues. Dialogue is clean and clear throughout with no major technical problems. With that said, the entire track is mixed a little low compared to most other releases. Effects work and music are both solid within the single channel presentation, but range is definitely on the flat side. Still, key design choices involving specific sounds like falling sand and clanking keys work well to bolster the film's mood. Crackles and pops are thankfully absent, but there is some faint background hissing in a few scenes. More or less on par with most mono tracks from this era, the audio here gets the job done just fine with a respectful and authentic mix. Criterion has provided a strong assortment of supplements, including a commentary and lots of material with the film's director. All of the special features are presented in upscaled 1080i with Dolby Digital 1.0 audio and no subtitle options (unless noted otherwise). Commentary by Neil Sinyard – Neil Sinyard, the author of "Journey Down Sunset Boulevard: The Films of Billy Wilder" sits down for this track recorded in 2007. Sinyard provides an eloquent and informative academic discussion that touches upon production history and offers analysis on the movie's characters, plot, and visuals. The discussion can be a tad stuffy at times, but there's a lot of worthwhile insights here as well. Portrait of a "60% Man": Billy Wilder (HD, 59 min) – Presented in 1080p, this is a 1980 Documentary focused on the legendary director. The doc traces Wilder's early life, pre-film jobs, his path to Hollywood, and his subsequent filmography. Marked by an interview with Wilder himself and a few remarks here and there from collaborators like Jack Lemmon and Walter Matthau, this is a wonderful documentary filled with witty insights and stories about filmmaking. Billy Wilder at the American Film Institute (HD, 24 min) – This is an excerpt from a 1986 interview with the director. Wilder addresses a wide range of topics including the challenges he faced working in Hollywood, his writing process, and his directing process. Of course, all of his answers feature the filmmaker's trademark cynical wit, leading to a funny and informative conversation. Kirk Douglas (HD, 14 min) – Here we get a 1984 interview with the film's star. Douglass discusses his knack for playing unsympathetic characters and what it was like to work with Billy Wilder, offering lots of admiration for the celebrated director. Walter Newman (HD, 10 min) – This is a 1970 audio interview with the film's co-writer. Newman elaborates on how he got involved with the project and describes his working relationship with Wilder. Spike Lee Afterward (HD, 6 min) – In this featurette, director Spike Lee talks about meeting Billy Wilder and recounts his great admiration for 'Ace in the Hole' and its themes. Stills Gallery (HD) – Here we get a collection of production photos and behind-the-scenes shots. Trailer (HD, 2 min) – The film's trailer is included in 1080p with Dolby Digital 1.0 sound. 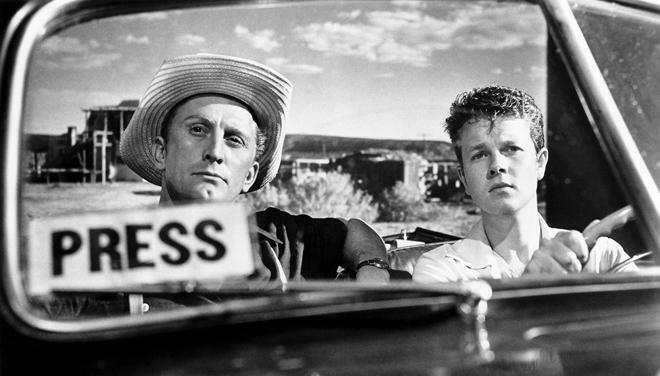 Billy Wilder's 'Ace in the Hole' offers a biting examination of American media culture marked by great performances, noir sensibilities, and cynical observations. Truly ahead of its time, the movie serves as a disturbing representation of selfish exploitation and America's unfortunate obsession with sensationalized reporting. The video transfer is great, providing a richly filmic experience. Likewise, the audio mix is very solid, with only a few minor age-related issues. Supplements are plentiful and informative, offering lots of amusing insights from the movie's legendary director. This is an exceptional release from Criterion for an exceptional and sadly overlooked film. Highly recommended.